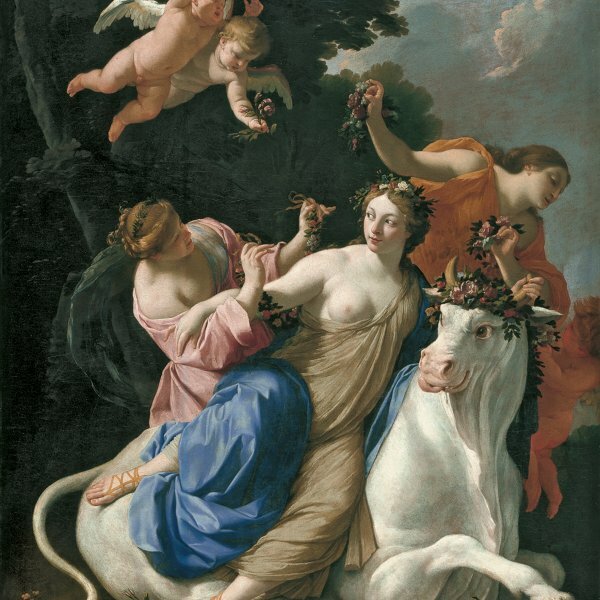 Within the work of the Le Nain brothers, Antoine, Louis and Mathieu, their genre paintings are the most appreciated, although they also produced religious and mythological compositions and portraits. As genre painters their most popular subjects were those that depicted the world of the French peasant, who is presented as poor and humble but dignified. Little is known regarding their training, except that they were first taught by a foreign artist. They moved to Paris around 1629, living in Saint German-des-Prés. With regard to the eldest brother Antoine’s career we know that in 1629 he was registered as a master painter in the Saint Germain artists’ guild and that in 1632 the City of Paris commissioned him to produce a group portrait of members of the city council. The three brothers were founders of the Royal Academy of Painting and Sculpture, founded in March 1648, two months before Antoine’s death on 26May. The Le Nain brothers used their family surname on the works that they signed, but did not include their names or initials. The results of this practice have been widely debated by art historians, who have attempted to distinguish between the styles and hands of the three brothers. The accounts left by the novelist Du Bail and by the brothers’ first biographer, Claude Leleu, have been helpful in this respect. According to these two sources Antoine, to whom the present panel is attributed, was outstanding for his miniatures and small-format portraits. First mentioned in the literature by Biermann, the present oil on copper has always been attributed to Antoine, the eldest brother. It was dated by Charles Sterling to shortly after 1640, who saw the hand of Antoine in the heads and Louis in the poses and clothes. According to that author, the style of the two artists can be distinguished by the different treatment of these parts of the painting and the type of brushstroke, which defines the features very precisely in the faces, but which is sketchier and more freely applied in the clothes. This type of painting of a group of children is frequent in the work of Antoine Le Nain. These small-format paintings depict children singing or playing, arranged in simple compositions such as the present one. Here the figures, which are all standing, are arranged almost in a straight line, with the three boys slightly more to the foreground occupying the centre and right half of the composition. Two of them are playing a small tambourine and a stringed instrument while the one in the middle is singing. Slightly behind them and on the left are two girls. The greys, browns and earth tones that prevail in the foreground and in the clothes of the children contrast with some areas of bright, strong local colour such as the red of two of the jackets and the blue apron. 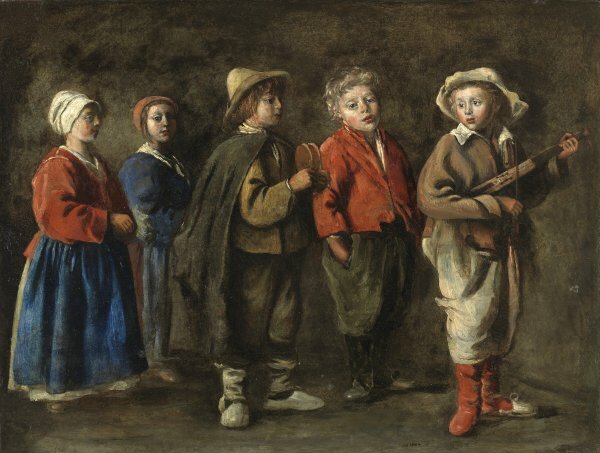 The present panel has been compared to The old Flageolet Player in the Detroit Institute of Arts, which has a figure with the same pose as the boy in the centre of the present group with his hands in his pockets, looking directly at the viewer. It has also been compared to a small-format oil with six figures, five of them boys with musical instruments, but whose composition is more complex than this one. The present composition is also known in two copies, one with a sketchy landscape background in a private collection, attributed to the studio of Le Nain, and the other in the Leipzig Museum.